Rose Coschignano/Pipe Dream Photographer Junior catcher Sara Herskowitz had five hits in a doubleheader against Albany, including a three-run home run in the first matchup. 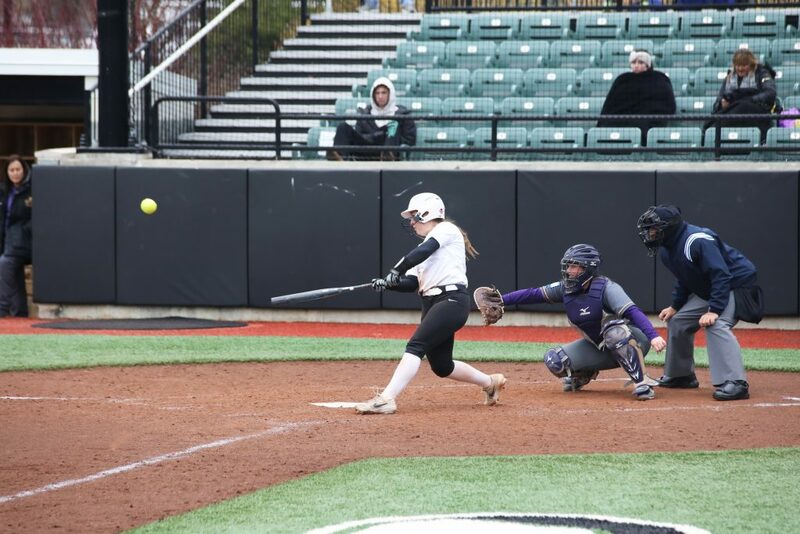 Facing the second-place Albany Great Danes in a doubleheader, the Binghamton softball team dropped two games defined by singular innings in which Albany took over. Junior pitchers Rozlyn Price and Rayn Gibson each put together excellent starts to their respective pitching performances, but allowed a combined 14 runs in their final innings of work. The Great Danes (16-9, 5-0 America East) rode these runs to a sweep of the Bearcats (14-18, 3-5 AE). Junior catcher Sara Herskowitz provided most of the power for Binghamton in the first game, going 2-for-3, scoring two runs and recording three RBIs off a home run in the bottom of the first. In the home half of the third, after Herskowitz singled and stole second, she was driven in by sophomore utility player Sarah Benn. Despite extending their lead to four, the Bearcats stranded three runners on base in the third with an opportunity to blow the game open. Things began to fall out of BU’s favor in the top of the fourth inning, in which the Great Danes scored eight runs to take control of the game’s momentum. Price started the game for the Bearcats and was cruising before the fourth frame, allowing only two base runners beforehand. Albany’s damage in the inning was both started and ended by sophomore infielder Katie Falotico, who led off with a solo home run to right field. After the Great Danes tacked on four more runs via a plethora of singles and a wild pitch, Falotico got to the plate again with two runners on base and capitalized with a three-run blast to center, making the score 8-5 in favor of Albany. Throughout the inning, Price remained on the mound with sophomore pitcher Chelsea Howard warming up in the bullpen. Howard relieved Price at the start of the fifth inning. As Binghamton looked to cut into its newfound deficit, the team continued to allow insurance runs to the Great Danes. In three innings of relief, Howard allowed five runs on six hits, three walks and a hit batter. Ultimately, the Bearcats could not keep pace with their SUNY rival, dropping the opener, 13-5. The nightcap featured a stark contrast in offensive production, highlighted by a pitchers’ duel between starters Gibson and Albany sophomore Maranda Jimenez. After each allowed one run in the first inning, the subsequent four-and-a-half innings were scoreless. The tie finally broke in the bottom of the sixth, when Benn lofted a double just out of the reach of Albany sophomore outfielder Alexis Phillips with the bases loaded, scoring three to take a 4-1 lead. Despite Gibson surrendering no earned runs through the game’s first six innings, Albany tagged her for six runs in the top of the seventh. Albany loaded the bases on two walks and a single, and Falotico ripped a bases-clearing double of her own to tie the game. The Great Danes continued to flip momentum, as junior infielder Kelly Barkevich blasted a go-ahead three-run homer to right field. Down 7-4 in the bottom of the seventh, BU went down in order, concluding Albany’s sweep. Herskowitz continued to make great contact, ripping three doubles and scoring two runs. Her three doubles tied a program record with Christina Quijano, ’07, who accomplished the same feat in 2004 against UMES. She also flashed some leather in the field over the doubleheader, making a couple of clutch plays on pop-ups. Jimenez proved a worthy opponent for Gibson, pitching five innings with a lone run allowed in the first. Before giving up six earned runs in the seventh inning, Gibson had allowed zero earned runs over a 15-inning stretch. Up next for the Bearcats is a three-game series this weekend against UMass Lowell, capping off the team’s five-game home stand. First pitch of the opener is scheduled for noon on Saturday, April 13 from the Bearcats Sports Complex in Vestal, New York.